They hadn’t heard of us at the front desk, which is never good when it is late and you’ve travelled all day to get there. Luckily a bit of checking and the booking was discovered by the two receptionists who both spoke English. We had arrived at the Historic Yerevan Hotel at 48 Hanrapetutyan Street, in the trendy Vernissage part of Yerevan. 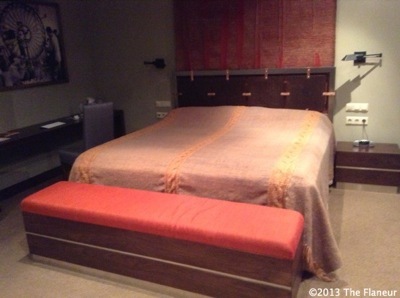 It is the fifth hotel in the Tufenkian chain of hotels – the first luxury boutique hotel chain in Armenia. The lobby was industrial chic, bare concrete walls with a well-stocked bar and free wifi. My room on the third floor was big with coffee-coloured walls, two armchairs, a long desk, and a large TV. The bathroom had trendy frosted glass doors and a deep white bath tub. Outside there was a balcony, inside a huge double bed. In fact to call it a double doesn’t really do it justice. A quadruple is a better description. The room was finished with a headboard of copper squares screwed together, an Armenian carpet on the wall behind and black and white neo-realist photos. Downstairs breakfast was served in the Kharpert Restaurant. It was one of those breakfasts that isn’t just eaten, it is displayed. 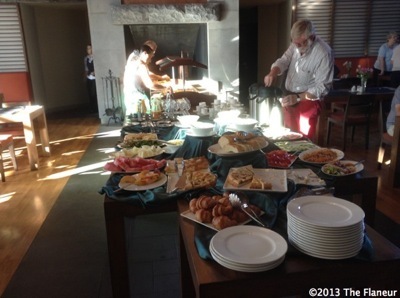 On a large central table there was a buffet with pastries and pancakes, as well as Armenian dishes, yoghurts, salads, cheeses, meats and different fruits. The melon was a high point, as was the chance to try various Armenian jams and preserved fruits. Later in the week I also stayed at the Tufenkian hotel in Dilijan. Though part of the same chain this has a completely different design aesthetic. The contemporary urban look of Yerevan has been swapped for a renovated 19th century artisans quarter, with rooms spread along the old Sharambeyan Street and a restaurant looking something like a Swiss chalet. I had a large room with a double bed and two singles. It was rustically decorated with part of the wall left unplastered to show the original stone work, the rest painted a pale earth colour. 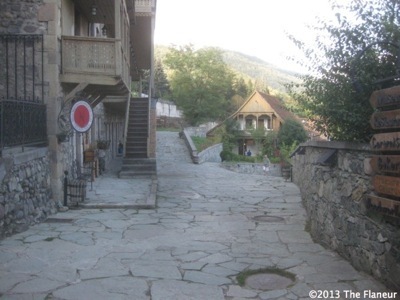 Dilijan was a well-known resort in pre-Soviet times, a blossoming centre of culture and commerce. Sharambeyan Street used to be home to different masters working in small studios and an attempt has been made to give the street an air of those creative times. As well as the hotel rooms the street also houses a wood turner and a ceramicist as well as a small museum with a collection of 19th century goods, including a loom and a record player. 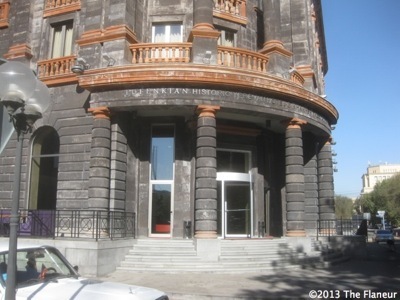 The Tufenkian hotels aim to provide visitors with a real Armenian experience. The food and the decor both help towards this end and I came away having enjoyed my glimpse of the Armenian tradition, cuisine and culture.